12.5" RCOS @ ~f/9 (2880 mm fl) 1.28 arcsec / pixel. Zoomify image scale is 1.28 to 3.33 arcsec / pixel. 1/11/2010 to 2/12/2010 Chino Valley, AZ... with CCDAutoPilot3 & CCDSoft. eXcalibrator for (b-v), (v-r) color calibration, using 18 stars from the NOMAD1 database. CCDStack to calibrate, register, normalize, data reject, combine the sub exposures, LRGB color. PhotoShop for on-linear stretching, sharpening and LLRGB combine. 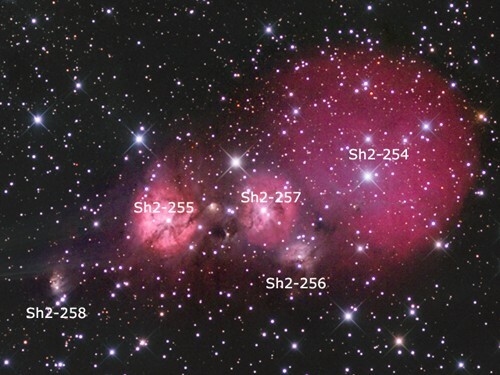 The Sh2-254 to Sh2-258 complex is located about 8000 light-years away, toward the constellation of Orion. 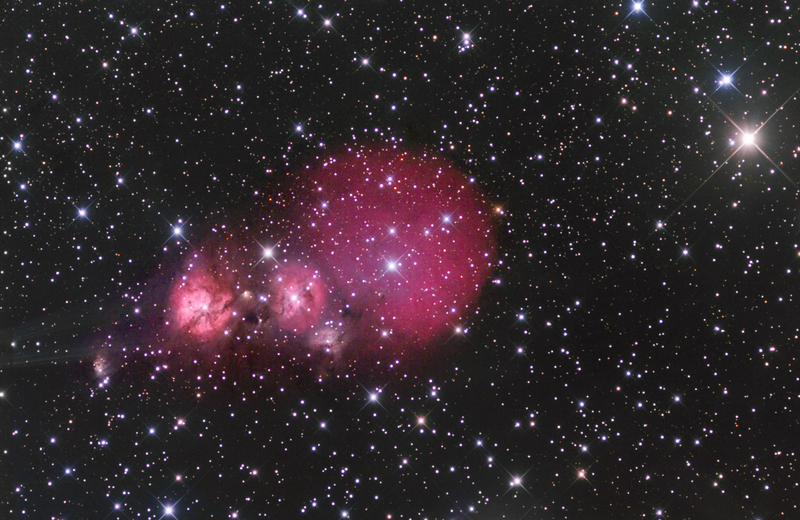 The structure is embedded in a large molecular cloud, centered between Sh2-255 and 257.